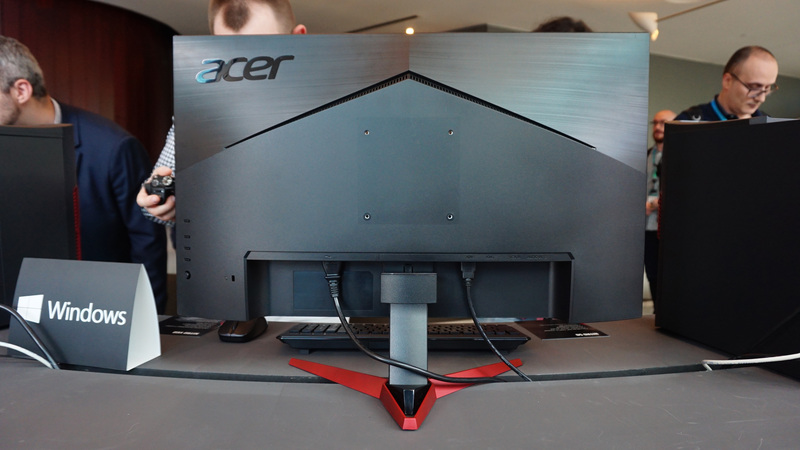 Just when you thought you’d had your fill of BRAND talk this week with the Asus Arez / ROG kerfuffle, Acer have jumped in on the action as well with the introduction of their new Nitro family of gaming monitors. 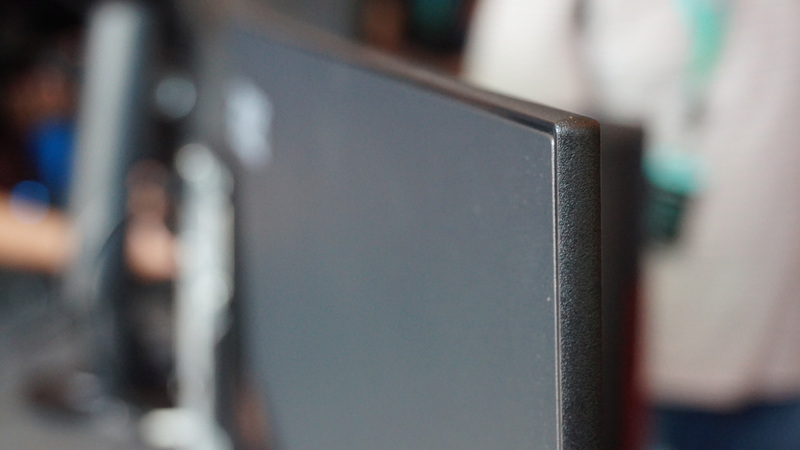 A more entry-level series than their flagship Predator range, these new monitors may not have all the bells and whistles of Acer’s Nvidia G-Sync HDR-enabled Predator X27, for example, but they still offer super slim bezels, high refresh rates up to 144Hz, AMD FreeSync support and resolutions that go all the way up to 4K – and judging from my hands on time earlier today, they could be just the ticket for those after a decent mid-range screen. At the top of the range is the Nitro VG0 series. Available in screen sizes of 21.5in, 24in and 27in with resolutions of 1920×1080, 2560×1440 and 3840×2160, this series of rather nice looking set of IPS panels boast a 1ms response time when you enable Acer’s ‘Visual Response Boost’ in the onboard menu. That’s a lot faster than you normally get on IPS screens, which tend to favour colour accuracy over speed, but it just goes to show you don’t necessarily have to hunt down a TN panel anymore to get the best response times. Yes, you may have to take a hit on the monitor’s overall brightness level in order to take advantage of it, which might be a problem in some lighting conditions when it’s only rated for a maximum brightness of 250cd/m2, but I’ll have to wait and see how things pan out in practice once I get one in for testing and can look at it longer than five seconds before other journos liveblogging with their phone on the end of a selfie stick come and plonk themselves directly in front of me. 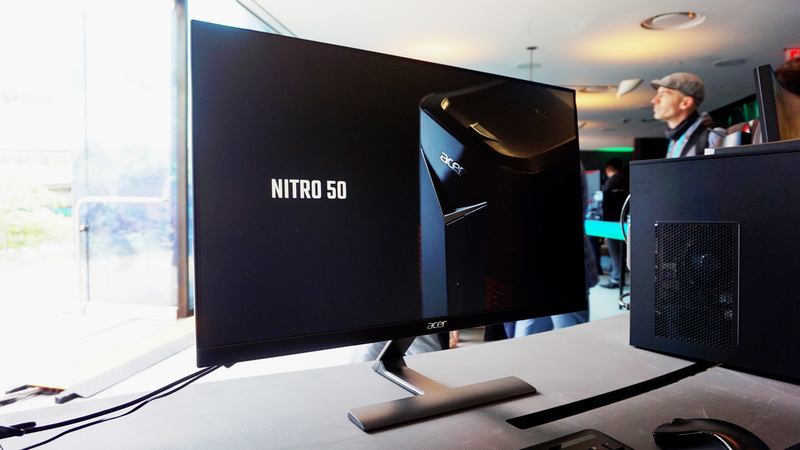 You’ll also get a choice of regular 60Hz refresh rates, as well as 70Hz, 75Hz and the top-end 144Hz for super-smooth gaming, but how much they’ll differ in price (and what resolution and panel size combo they’ll come in) is currently unknown at this point. All of them, however, will come with AMD FreeSync support, which should help to get rid of any tearing and stutter if your AMD graphics card isn’t quite up to the task of a hitting a full 60fps. Meanwhile, you get single VGA, HDMI and DisplayPort inputs round the back (although the actual model on show that I saw had two HDMI and no DisplayPort, so your final choice of ports may well depend on which region you’re in), as well as separate audio in and out jacks if you want something a bit beefier than its pair of 2W internal speakers, and a fixed, red pronged stand. Then there’s the entry-level Nitro RG0 series. Available in 24in or 27in panel sizes, these monitors have a 1080p resolution and a 75Hz refresh rate as standard, as well as the same 1ms response time you’ll find on Acer’s VG0 range. The RG0 monitors also max out at 250cd/m2 brightness, but it’s worth noting that Acer have only opted for 6-bit panels in this instance (albeit boosted up to 8-bit via a process known as Hi-FRC, or frame rate control, dithering), so their colour accuracy isn’t rated as highly as the proper 8-bit VG0 range. This is a shame, as I think the Nitro RG0 monitors are the more attractive screens overall when it comes to design. Their fixed silver stands look much smarter in the flesh than the plasticky gamerfied prongs on the RG0, and the entire screen measures just 7mm up at the top, giving each panel a lovely slim profile to go with their edge-to-edge displays and minuscule bezels round the front. Still, it will be interesting to see how the difference in colour depth is reflected in Acer’s pricing, which at time of writing is still being kept under wraps. Provided the RG0 monitors are cheap enough and not completely awful once I get round to testing them, though, they might just be a decent budget option for those after high refresh rate gaming without breaking the bank. I suspect, however, that it will be the Nitro VG0 monitors that will be the most highly sought-after option by cash-strapped gamers, although given the number of possible options available they may well end up being just as expensive as their high-end competitors. 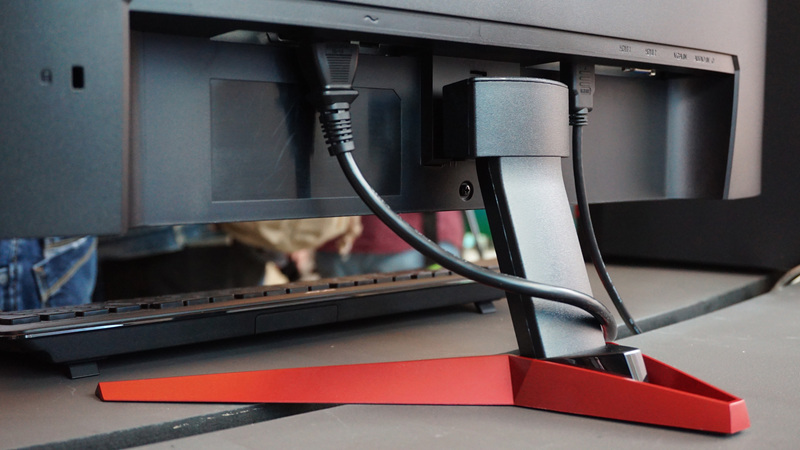 Only time will tell if they’ll be able to break in our best gaming monitor rankings, but for now they’re definitely one to watch.